To create optimal health, there is a critical level of calculus removal from the root surfaces necessary to form a gum seal around the neck of the tooth. The deeper the pockets are, the more difficult it is to achieve this level. That is why early detection of the disease is so important. In the early phase of periodontal disease the pockets tends to be shallow making calculus removal so much easier. If disease activity continues in spite of proper oral hygiene and careful scaling and root planing, surgical options may be considered. Surgery allows access to the deeper areas of the root surfaces for a complete calculus removal. However, if a person is not practicing optimum oral hygiene, surgical therapy is not a good idea since healing will be poor. The commitment to daily plaque removal must be very strong to assure optimum healing and post-surgical success. The surgical treatment is considered a minor surgical procedure that can easily be done in the dental office with local anesthesia (freezing). Once the problem area is identified, a small incision is made on the inside and outside tooth gum margins of the involved teeth(Figure 1). Then the gum tissue is gently teased away from the necks of the teeth to give access to the underlying root surfaces The root surfaces are carefully inspected and all residual calculus is removed. 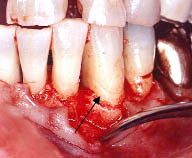 The infected tissues located in the bony defects (arrow) are removed as well (Figure 2). Where disease has eroded the bony surfaces, the bone may need to be reshaped. This will allow the gum tissues to snug up tightly around the necks of the teeth when stitched back into place (Figure 3). A small dressing (cast) is placed around the surgical site for comfort. The stitches and dressing are usually removed about a week later. The procedure does not seem to slow patients down very much. Most patients are back to normal activities the next day. Healing progresses very rapidly in the mouth! Surgical regenerative techniques have also been developed to help restore the lost bone and gum tissues due to periodontal disease (See our procedures section). Bone and gum grafts are available to be used in appropriate locations. Dr. Brar and Dr. Manhas can offer the best surgical options for your particular problem. THE PICTURES SHOWN ARE CASE STUDY PHOTOGRAPHS MEANT FOR EDUCATIONAL PURPOSES ONLY.